Transpower had a need to get additional power to Auckland’s Eastern suburbs and a project was initiated to run a 220 kv power line from Whitford to Otahuhu substation as part of the NAAN project. The preferred route required a crossing of the Tamaki Estuary and it was decided that this cable should cross inside the twin box girders of the Waipuna Bridge, which is part of the SEART motorway. Strengthening of the existing bridge to compensate for the additional loading was part of the commercial arrangement between Transpower and the bridge owner NZ Transport Agency. The designers of the strengthening, Beca decided on external post tensioning utilising the BBR CMB Band system developed by BBR Austria. This system has recently been granted European Technical Approval and this gave security that the system had been fully examined, tested and offered a most reliable solution. Fulton Hogan was appointed as head contractor with BBR Contech as suppliers and installers of the CMB Band Tendons. A single tendon was installed at the centroid of the cross section along each of the two box girders. 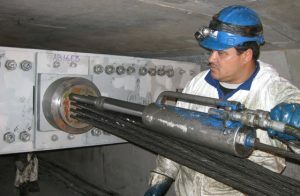 These tendons were terminated at each of the two movement joints along the length of the bridge resulting in the installation of 6 tendons each 150 metres in length. Tendons terminate at substantial steel beams bolted, at each end to the side walls of the box girder. Each tendon consisted of 4 layers of band material with each of these containing 4 15.9 mm diameter superstrands. 16 strands in all, stressed to a total force of 300 Tonnes.